at the GE Aviation Plant located in Auburn, Alabama. Copy-written materials in presentation used with permission of SHL Talent Measurement. In November 2013, the Occupational Safety and Health Administration (OSHA) released a proposed rule to make workplace injury and illness information publicly available on the internet in an effort to encourage safer workplace environments. Many think the rule is really to shame employers and encourage employees to seek out a union or plaintiff’s attorney. OSHA now mandates that an employer posts a paper notice in the workplace OSHA Form 300A, which lists a summary of the total number of job-related injuries and illnesses that occurred during 2013. The form must be posted between Feb. 1 and April 30, 2014. The summary must include the total number of job-related injuries and illnesses that occurred in 2013 and were logged on OSHA Form 300, Log of Work-Related Injuries and Illnesses. The form must be signed and certified by a company executive and displayed in a common area where notices to employees are usually posted. Employers with 10 or fewer employees and employers in certain industries are normally exempt. Copies of OSHA Forms 300 and 300A are available at http://s.dol.gov/YQ. The proposal to electronically submit OSHA Form 300 had its final public hearing on January 9, 2014. Once the regulation is final, OSHA plans to then take the electronic information and post at OSHA.gov. The proposal came after the Bureau of Labor Statistics reported that an estimated three million workers were injured on the job in 2012. Under the proposal, companies with more than 250 employees will electronically submit their illness and injury data to OSHA on a quarterly basis. The rule would also require 20-person firms in high-injury industries, such as home construction, to submit summary reports to the agency annually. In its press release OSHA gave as its justification: “Public access to this information will encourage employers to maintain and improve workplace safety and health in order to support their reputations as good places to work and/or do business with,” i.e. to shame employers. Common Sense Counsel: It is likely that attorneys will attempt to use the OSHA injury and illness data in workers’ compensation, personal injury, premises liability and product liability litigation, whether it is really relevant or not. The internet posting may also become a “scarlet letter” unfairly damaging an employer’s reputation. Look for the final Regulations to be released late spring 2014. More than ever, employers need to be looking to crack the “DNA of Safety” and hire those employee who do not have risk taking in their “DNA”. Validated Internet Administered Personality testing, combined with aligned favorable-trait job descriptions, is the only real alternative available to employers to reduce the human factor side of workplace accidents. No workplace accidents equal no unfavorable OSHA 300 reports. 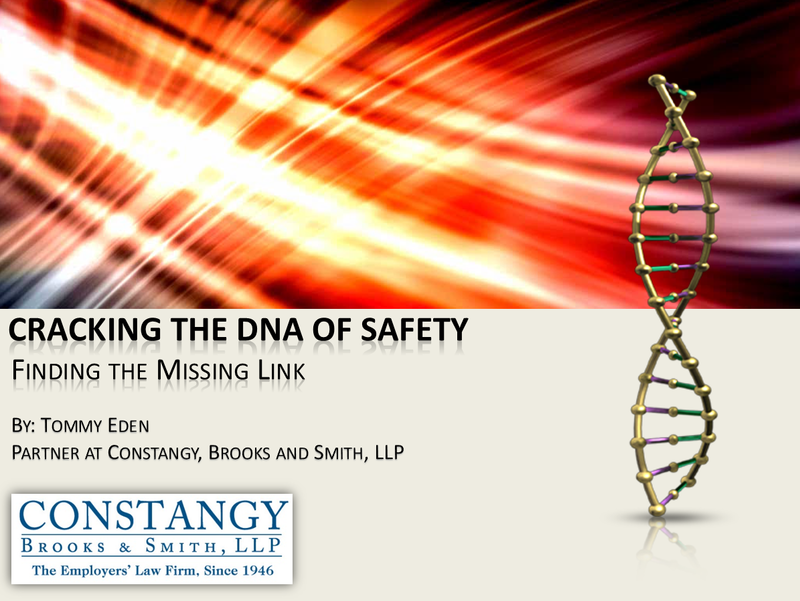 What is your Company’s DNA of Safety? Tommy Eden is a partner working out of the Constangy, Brooks & Smith, LLP offices in Opelika, AL and West Point, GA and a member of the ABA Section of Labor and Employment Law and serves on the Board of Directors for the East Alabama SHRM Chapter. He can be contacted at teden@constangy.com or 334-246-2901. Blog at www.alabamaatwork.com with YouTube presentation on topic.